Except, one thing. Where are they? Fertility rates in 2017 of 1.8 children for the average woman in the U.S., are down 14% from their peak ten years earlier, and are well below replacement level. This means–if fertility rates stay that way–a population decline in a matter of decades. Too, we know that people over 65 years of age are on track to outnumber children in about t-minus 16 years and counting. What’s more, overall population growth estimates into the middle part of this century have been reset, and lowered to reflect growth rates of just .7%, well below historical levels. The kids may be all right, but tell them that. If you can find them. Welcome to our world of jobs vs. good jobs. Of housing vs. attainable housing. Of young families aspiring to find a balance of livelihood, and affordability, and community in one and the same place and finding it increasingly challenging to do so. Focus only on “the new geography of jobs” and you’ll see an intensely dynamic transfer of value, of talent, of economic impact from a vast, dispersed four-corners of the earth map to a relatively few mega capital and brain-power centers. That’s an important macro trend, but from a long view perspective, it may be fleeting. For home builders and developers, it may be increasingly irrelevant. It matters, because reflexively, and mostly for good reasons, most home builders picture young families–married with-children couples in the early stages of their family-making–as the lion’s share, and iconic visual reference point, of their business. Dreaming, in many “journey-maps,” precedes “exploring, which comes before “focusing,” followed by “purchasing,” etc. Think “engagement ring.” Think “baby shower registry.” Think “pregnancy test.” These behaviors–logically, and in the minds of most builders–are very strong clues of aspirations, intentions, and behaviors to come. An engagement ring, a bridal registry, a pregnancy test, a baby gift registry today are like the great big billboards on a customer’s journey from the standpoint of Big Data. This is great progress in learning that finding that “moment to engage” with a prospective customer, and do it by standing for value from the get-go. This lesson is vital to builders, and begins to awaken them to the grand notion that customers no longer want a simple transaction when it comes to the home they buy. What they want is a relationship that can stand a test of time and trust and service and care. So, back to the kids, and why they may not be all right–save for a more and more narrowed map of markets, submarkets, job centers, housing spectra, etc. Technology–bandwidth, fiber optics, 5G–continues to impact “where” in hugely important ways. Ways that allow people to remotely generate value for firms, for their households, and for communities. That dimension is a constraint-buster. Second-wave workers, particularly coders and those involved in media-centric work, for example at Google, may prefer an urban location. “The new economy, epitomized by Amazon, neither requires nor offers loyalty to its employees,” Modarres notes. “They need the largely youthful ‘creative class’ to give a few stressful years of their lives to innovate, pad their CVs and leave for the next job, hopefully in less expensive places. They work hard, live fast, and burn out in a few years, ending up often in more suburban and other less-costly areas.” These urban habitués are usually short-timers. Demographer Wendell Cox, looking at the nation’s 53 largest metros, found that residents in their urban cores remained there, on average, for just 2.4 years, while suburban and exurban residents stay seven to eight years. The second-wave model is ideal for the young and restless but not for those entering middle age. 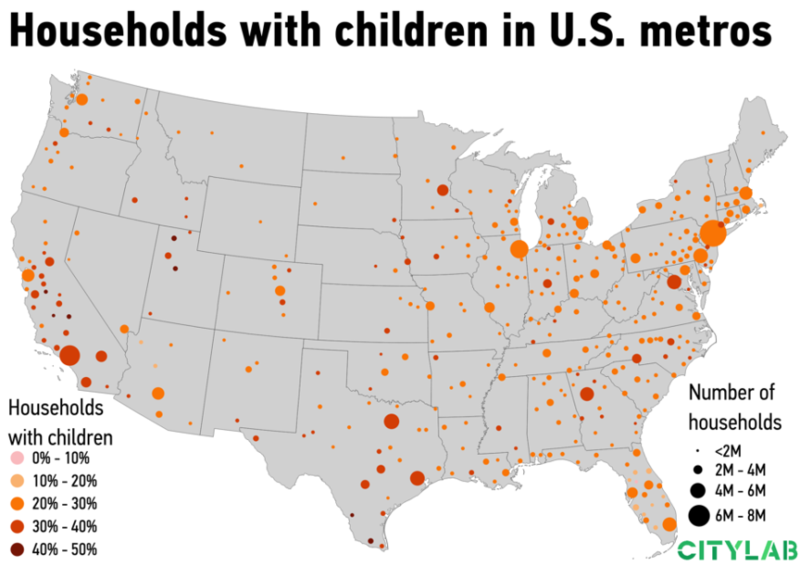 What it boils down to is that childlessness is a product of a very limited number of cities, like San Francisco, Seattle, and Washington D.C. And even in those places, the broader metro area is not so far off from the rest of the country. Actually, childlessness is only a phenomenon of a few uber-expensive neighborhoods in a few super-expensive cities. The issue, and my question is this. If the “dreaming” part of many a buyer’s journey ties so powerfully to this phenomenon of young households on the straight and narrow toward family formation, what about the 70% of other U.S. households who are not on that pathway? Too, since the new geography of kids is one of America’s dynamically evolving trends, Big Data that may do a good job of flagging “when” to engage with a household, had also better get pretty damned good at how to read where that household may wind up taking that next big step into family formation. And underlying the demographics and geography questions, it’s this. If home builders have relatively recently discovered empowerment by pushing their attention and focus months ahead of an actual transaction, will they push it far enough ahead? And having done so, how will they actively enter a prospect’s “dreaming” stage–whether that prospect is 28 or 40 or 59–with an immediate value proposition that promises a relationship rather than just a deal? This article first appeared at Builder Online.